Just about everyone enjoys music, whether by singing along, playing an instrument, or just enjoying a good listen. Despite this enormous interest, many schools are choosing to do away with their musical education programs. This act is a MASSIVE mistake. Not only are schools losing an enjoyable subject (which, for children, there’s often few of), they’re forcing students to miss out on opportunities that would enrich their education and livelihood. Although there are more benefits to having music in schools than you could imagine, twenty strong examples are given below. #1 – Students develop, through musical training, a strong sense of language and reasoning. Students whose lives involve musical education will strengthen the areas of the brain related to both interaction and logic. The left side of the brain becomes better developed through the use of music, and songs can help imprint helpful information on young minds. #2 – Music massively boosts a student’s memorisation abilities. Even when performing with sheet music, musicians are continually using their memory to play. We all know how vital a good memory is, and music is an excellent way to improve those abilities. #3 – Music teaches students to deliver high-quality work. Learning music promotes good craftsmanship. After all, it’s effortless to differentiate between good and mediocre music. Students want to impress their tutors and classmates more than you’d think, and this development applies to all subjects of study. #4 – Music helps develop coordination. Students who practice with musical instruments continually improve their hand-eye coordination. Just like when playing sports, students can develop their motor skills when playing music. #5 – Music helps students gain a strong sense of achievement. Learning to play a piece of music on a new instrument can be very challenging, but is indeed an achievable goal. Students who master even the smallest goal in music will take great pride in their achievements, helping them develop a strong sense of confidence. #6 – Music helps students stay engaged in school. An enjoyable subject like music can keep children both interested and engaged when they are at school. Statistically, students involved in musical programs are more likely to stay in school to achieve in other subjects. #7 – Music helps students succeed in society. Music is deeply entwined with the internal fabric of our society, even affecting the way we see one another. Positive influences from music can help shape the abilities and character of students in a preferable direction. Recent studies state that students in bands or orchestras at school are less likely to abuse substances over their lifetime. Musical education can also contribute significantly to a child’s intellectual development as well. #8 – Music assists massively with emotional development. Students involved with music tend to be more emotionally developed than their peers, with a stronger sense of empathy towards those from different cultures and backgrounds. #9 – Students, through music, enhance their pattern-recognition. Children can develop their mathematics and recognition skills with the help of a musical education. And, while learning in the form of music offers the necessary repetition to learn, it is packaged in a much more fun format. #10 – Music often helps children achieve a higher grade. Studies indicate that students who received musical education during their schooling attain several percent increases to their scores in English and Mathematics courses. #11 – Students fine-tune their auditory skills through music. Musicians can better detect essential, information-bearing elements in sounds, such as the emotional meaning of a baby’s cry. Student’s who have a significant musical education often possess an improved auditory attention, picking out subtly predictable patterns from surrounding noises. #12 – Music helps to build imagination and intellectual curiosity. 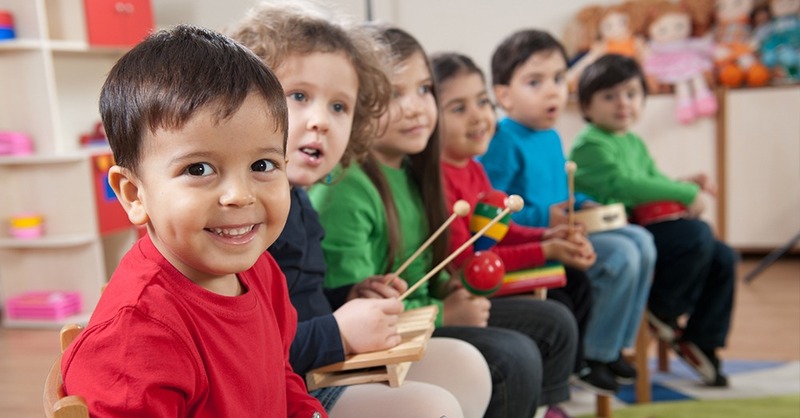 Introducing music in the early childhood years of students can help foster a positive attitude towards learning and curiosity. Artistic education develops the whole brain, especially a child’s imagination. #13 – Music helps relax students, an essential aid during exams. On average, students receiving a musical education feel a reduced stress reaction during exam periods than those who are not. #14 – A musical education helps teach a student discipline. Children who learn to play an instrument learn valuable lessons in control. They will be required to set aside time to practice, as well as rise to the challenge of learning to master playing their instrument through focus and discipline. #15 – Music prepares students for the new, more creative economy of today. Investing in an arts-focused education can ready a student for the 21st century’s workforce. The new economy has far more artistic careers, and these jobs very well may grow faster than others in the future. #16 – Music aids in development through creative thinking. Students who study the arts better learn how to think creatively. This kind of education can help them solve problems by thinking outside the box, realising that many questions have more than one correct answer. #17 – Music helps develop spatial intelligence. Students who study music can improve the development of their cognitive capacity, which allows them to perceive the world accurately and form complex mental imagery. Spatial intelligence is beneficial for advanced mathematics and more. #18 – Through music, students learn teamwork. Many musical education programs require collaboration as a part of a band or orchestra. It is through these groups that students will how to cooperate and build camaraderie. #19 – Students will learn about responsible risk-taking. Performing a musical piece teaches children how to handle fear and anxiety. This knowledge better equips students to deal with the inevitable situations that will come later in life, allowing them to increase their success and reach their potential. #20 – Music improves a student’s self-confidence. With encouragement from teachers and parents, students learning to play a musical instrument can build both pride and confidence. Additionally, a musical education helps students develop better communication skills, an essential tool in everyday life. With all of these benefits coming from an education in music, don’t YOU think it’s irresponsible for schools to disregard the opportunities such courses offer?